Eucalyptus makes your shower smell wonderful and adds a bit of nature to your bathing experience. 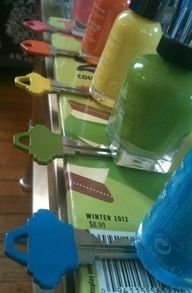 Color code your keys with nail polish. Use baskets and magazine racks to organize various items in your pantry. Crown molding works great as a place to store all those heels. Use old fashioned door knobs as fashionable towel hangers. To keep rugs from slipping, caulk them to the floor. Pool noodles can help save your car doors and the garage wall! Use a drink dispenser to store laundry soap for easy access. Letter organizers are great to stash away flip flops. After painting a room, store some paint in small jars so you have some on hand if you need to touch up. Make a magnetic shelf to store your keys on!